Put in at North Thompson River Park. Take out at ferry in McLure. We did this route with our three kids (ages 1.5, 3.5 and 6) along with another couple. We put in at the North Thompson River Provincial Park just outside of Clearwater, and we'd left our shuttle vehicle parked at in the ferry parking lot in McLure. 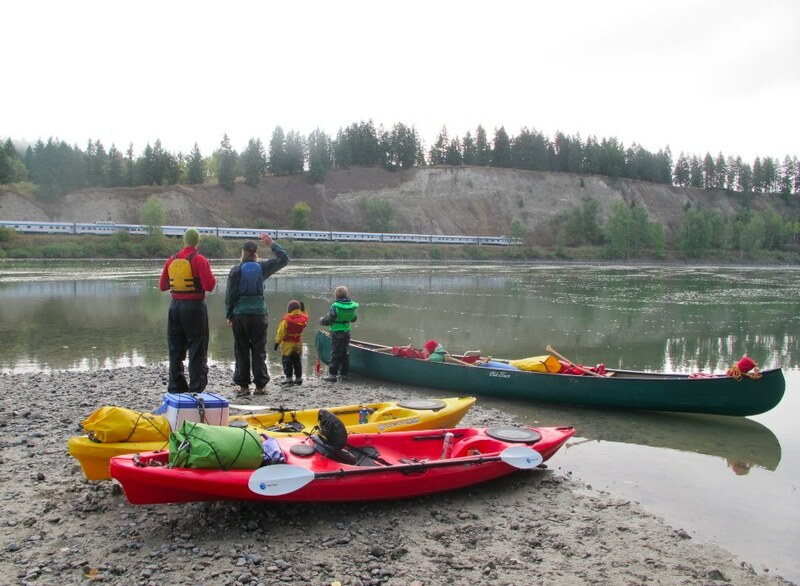 Guessing it was about 75km of river travel, but not exactly sure. We did it in 2.5 days, paddling for about 2 hrs in the morning, stopping for lunch and then paddling about 2 hrs in the afternoon. At this time of year the paddling was really easy as the river was low, so anything we encountered was class 1 at best. A few patches where it was shallow and we had to pick our line to avoid bottoming out on the rocks/mud. Water was moving fairly quickly when we started, but as we got closer to McLure the current slowed quite a bit. 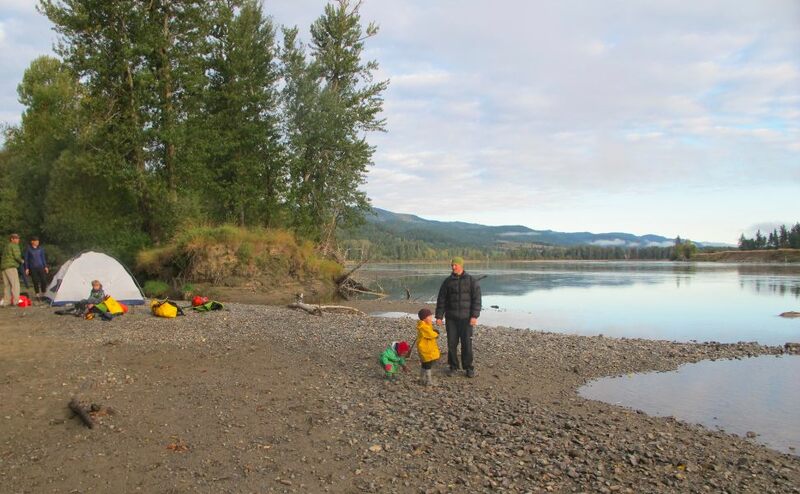 Lots of camping options along the way on gravel bars/riverside. Train tracks follow the river which was great for us as it kept the kids entertained, but not everyone might like the noise that comes with the train. We didn't encounter any other boats on the river, had the place to ourselves. BUT, it was raining for the first 2 days pretty heavily off and on, which might explain that. 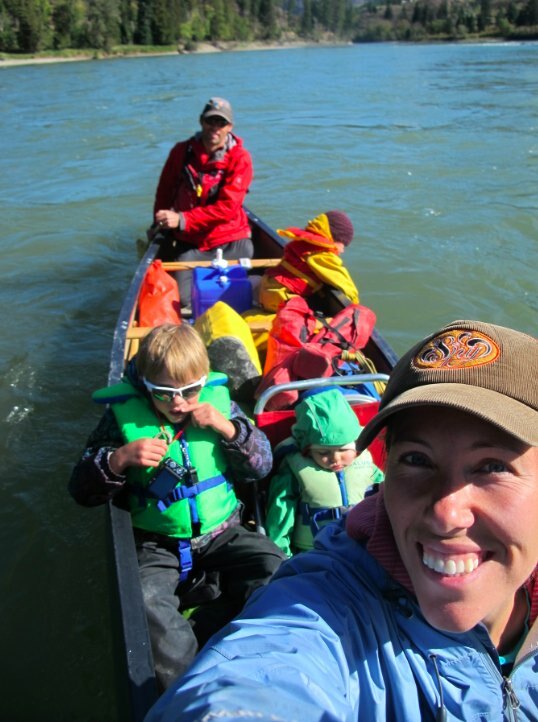 2 days of canoe travel with soggy, cold kids was a challenge, but the sunshine on our last day made up for it. Saw dozens of bald eagles, dozens of spawning salmon (river was surprisingly clear on the first 2 days, then became very murky and rose about 2 ft overnight on our last night). We paddled our 20' Old Town Tripper which fits all 5 of us comfotrably, though it's not speedy in the slower water. It was a beautiful trip, despite the rain, and we'll definitely do it again one day. Trains honking for the kids (including at 6am). 20' Old Town Tripper, with a full crew. A break in the rain just in time for camp set up.